The stories that shaped the conversation about what, how, and where we ate this year. This year, like any post-election year, was filled with political rancor, partisan potshots, and the growing pains of an adjusting nation. Yet among the breaking news alerts and scandals, food certainly found its own foothold in the 24-hour cycle. Colorful ingredients caught our eyes, brands vied for our attention, and major personalities challenged and, in some cases fell short of, our expectations. Here, in no particular order, are the 25 biggest news stories Food & Wine covered in 2017. In what is arguably its most noteworthy acquisition to date, online retailer Amazon solidified its attempts to sell consumers everything by acquiring the popular yet struggling chain of organic grocery stores despite Whole Foods founder John Mackey’s vocal reactions before and after the deal. Among the many changes were immediately lower prices on some staple items. With members of congress and Hollywood movie moguls stepping down because of sexual harassment claims, the food industry was in no way immune. Chefs and restaurateurs like Mario Batali, John Besh, and Ken Friedman all made headlines as victims came forward with allegations. The craft beer boom is far from over, and with an average of about two breweries opening in the U.S. every day, it’s no wonder America topped 6,000 this year, the most we’ve ever seen. Eighty-three percent of Americans now live within 10 miles of a brewery. While GrubHub, Postmates, and other app-enabled delivery services have been around for while, 2017 saw an upswing in big chains like McDonald’s, Wendy’s, Red Lobster, and Olive Garden either partnering up or venturing out on their own to give millennial consumers what they want: food, at home, on demand. Facebook even folded the feature into its interface. Not to be outdone, delivery stalwarts like Pizza Hut are upping their game with added perks like beer and wine. A stark turn from the Obama administration in more ways that one, much was made of President Donald Trump’s eating habits on the campaign trail and in office. White House chefs were told to recreate McDonald’s classics, Lay’s potato chips, Diet Cokes, and Oreo cookies are well-stocked wherever the commander-in-chief goes, and trips to other countries have put a spotlight on his penchant for “American” cuisine and well-done steak. In another attempt to Amazon-and-Google-ify our lives, the companies’ Echo and Google Home smart devices have picked up a bunch of new tricks in 2017. In addition to helping you write a grocery list or order groceries, they’re able to help curb food waste, order from Starbucks, buy you beer, pour you a shot of Jim Beam, and then track your alcohol consumption. Easily the most Instagrammable product Starbucks has launched in years, the multi-colored beverage launched many mythical sequels and an obsession with all things Unicorn. Whether or not tropical fruit atop a cheese- and tomato-sauce-slathered pizza tastes delicious is beside the point. As with anything in the Internet Age, the point is to argue about it. This year saw everyone from Alton Brown to Gordon Ramsay to the president of Iceland weigh in, and Italy even taking internationally-sanctioned steps to protect its precious pies from pineapples. On New Year’s Eve of 2016, René Redzepi shut the doors on his oft-deemed “world’s best restaurant” Noma to take a break, regroup, and get inspired. Of course, for Redzepi, that “break” included popping up Noma Mexico in Tulum last April where the menu focused on local ingredients, including insects. But finally, in November, it was announced that reservations would be available for Noma 2.0, set to open in Copenhagen in February of 2018. They sold out nearly immediately. 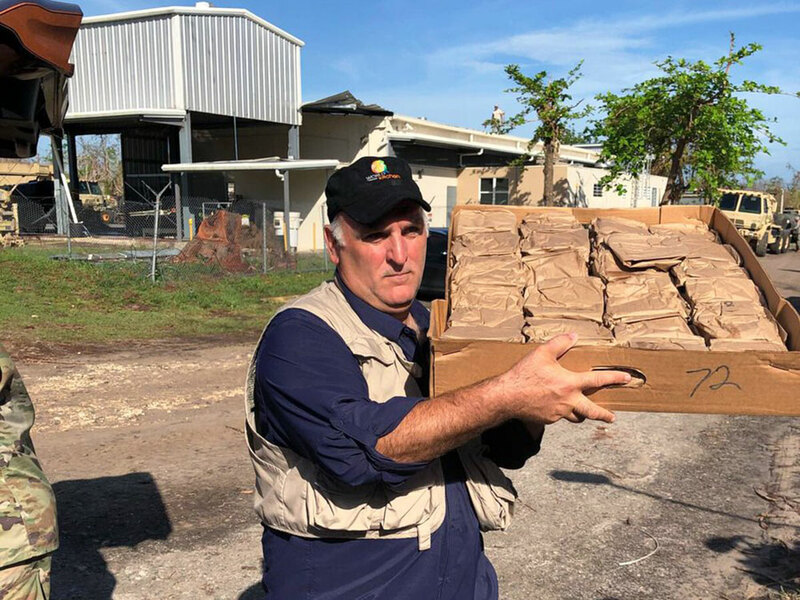 In a year when Mother Nature took her toll on the country, from flooding in Houston to hurricane-ravaged Puerto Rico to wildfires blazing their way through California, José Andrés and his fellow chefs via his non-profit World Central Kitchen, mobilized food and other resources, ultimately serving over 3 million meals in Puerto Rico alone. While we can debate whether or not Twitter has been good for the public discourse, the social media platform has certainly led to some inspiring moments. Take Carter Wilkerson, who casually asked the famously sassy Wendy’s Twitter account how many retweets he’d need to get free nuggets for life. The answer? 18 million. Falling short of that by about 14 million, however, Wendy’s still agreed to give Wilkerson his prize. After all, he does currently hold the record for most shared Tweet of all time. In October, fires raged in California’s Napa and Sonoma valleys causing mass evacuations and damaging well over 200,000 acres in and around the wine-growing region. While many homes and businesses were devastated, our Wine Editor Ray Isle (who was on the ground in California at the time) says there’s still hope for this year’s vintage, which is good news for winemakers looking to recoup from the disaster. This year saw fast food not only on our placemats but on the runway as well. Taco Bell teamed up with Forever21, KFC put out its own line, McDonald’s delivered clothing via UberEats, Arby’s gave people literal Meat Sweats, White Castle’s new uniforms were designed by Telfar, and companies like Heinken and Coca-Cola teamed with A Bathing Ape and KOIO (respectively) to bring us stylish new ways to show brand loyalty. While being known as the “world’s best pastry chef” would be enough for some, for Dominique Ansel the call of the savory was too tempting to ignore. In October of this year, the master baker opened the doors on 189 in Los Angeles, making his first official foray into all of the courses that come before dessert. It certainly seemed like the concept of a “bleeding,” meat-like vegan burger patty would have legs when we were first introduced to the concept. But the accelerated rate at which Impossible Burger and Beyond Burger have made their way into grocery stores and restaurants in 2017 has turned a niche product into a national phenomenon. No stranger to sassy comments and clapbacks, it’s no wonder model, author, and TV host Chrissy Teigen’s Twitter profile has over nine million followers. And those lucky millions also got the follow the drama and satisfaction of Teigen’s epic food day back in September, when she not only got more A1 steak sauce than she could handle, but also traded a pair of husband John Legend’s undies for some brown bananas to make bread, dubbing the finished product “our banana bread” to honor the social media community that made it happen. Food is always a ripe topic of conversation, and considering that these days most conversations take place via texting and social media, it’s no wonder we’ve seen a huge rise in food icons populating our new, visual vocabulary: emojis. This year saw José Andrés successfully lobby for an accurate paella emoji, Google scramble to put the cheese in the right spot of its burger emoji, and Apple adding dumplings and takeout containers to sate our appetites. If there’s a case to be made that there are too many music and food festivals happening these days, 2017’s Fyre Festival in the Bahamas made it. As more event organizers look to cash in on millennials’ desire for mass gatherings, there are bound to be mistakes. Fyre Festival’s food vendors bit off more than they could chew by not bringing enough of the promised food for everyone to nosh on, serving up white bread with slices of cheese and undressed salad greens. The fest’s name has since become synonymous with similar debacles. Comedian and known-foodie Aziz Ansari’s critically-acclaimed Netflix series Master of None has been known to sprinkle in the star and creator’s love of a good meal. But season two saw Ansari’s Dev and actor/winemaker Eric Wareheim’s Arnold travel to spots like Modena, Italy to eat, cook, and find heart-wrenching humor. The season’s “Thanksgiving” episode about Dev's childhood friend Denise’s attempts to come out as gay to her mother was even honored with an Emmy for comedy writing. After closing on June 9 for renovations, Daniel Humm and Will Guidara popped up the EMP Summer House in the Hamptons to keep the party going while their Manhattan location was temporarily out of service. 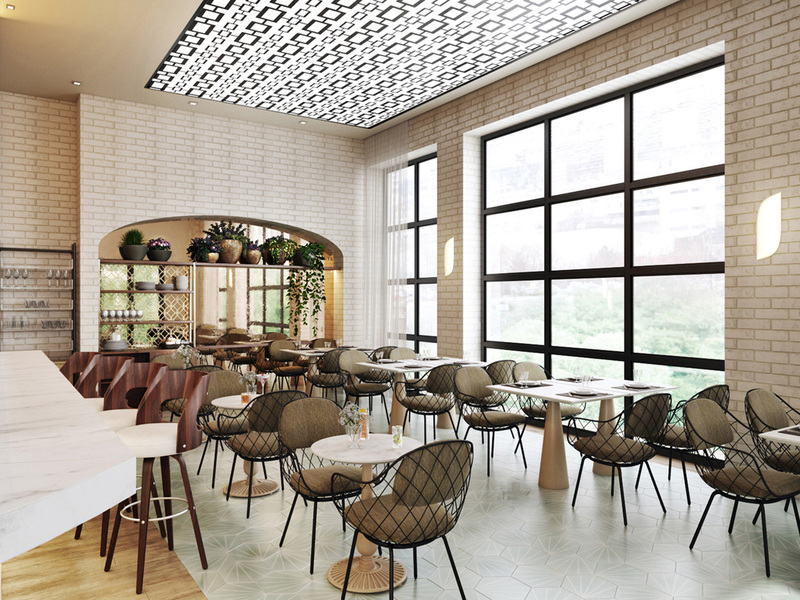 Then, in October came the triumphant return of the “world’s best restaurant” with new digs, a new menu, and a $24 cup of coffee. While summer 2016 was all about the “frosé,” 2017 proved we couldn’t get enough of the pink-hued wine. Literally. Forty-ounce bottles from Patrick Capiello’s Forty Ounce Wines took over Instagram and filled a special malt-liquor-bottle-shaped hole in our collective hearts. As a direct response to Unicorn-ism in food, and to satisfy all of the “detox” devotees out there, activated charcoal popped up as a goth-friendly ingredient. Matcha’s green tones continued to color drinks and desserts, topping Google’s search terms for the year. And while no one year can claim the rise of turmeric as the go-to superfood of the moment, early 2017 saw this spice getting more and more attention. But to truly cement turmeric (a spice people have used for millennia) as having gone “mainstream,” we’ll point to Starbucks putting a yellow-tinted latte on the menu. 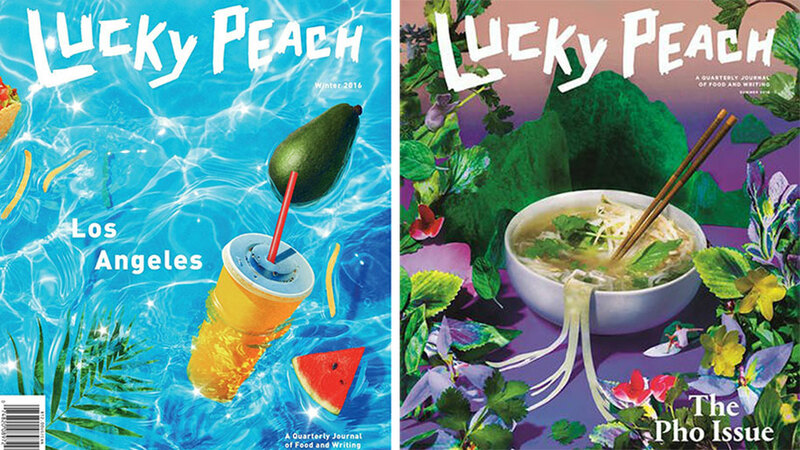 The food scene’s most indulgently insider magazine, Momofuku’s David Chang and writer Peter Meehan’s Lucky Peach swiftly and unexpectedly ended its six-year run in May along with a final book that hit shelves in April. Each issue focused on a single theme, a dish like pho, a city like Los Angeles, or an ingredient like chicken. Lucky Peach won nine James Beard awards, including Publication of the Year in 2016 and a National Magazine Award. Perhaps the biggest punchline of food news this year, this juice maker squeezed itself out of existence when a Bloomberg investigation revealed it was just as easy to hand-press the proprietary packets as it was to use the $400 machine. The hype and subsequent downfall of Juicero just goes to show there doesn’t need to be a Keurig for everything.